Legacy of Hope planned giving for OSF Healthcare Foundation offers many benefits when you choose to fulfill your philanthropic goals through intentional estate planning. 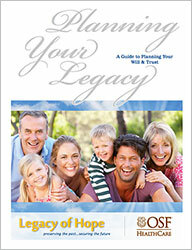 As you explore the helpful resources provided by Legacy of Hope, please know there are additional resources and information available at www.osflegacyofhope.org. Intentional estate planning and directed gifting allows our voices to be heard for generations to come. A charitable bequest is one of the easiest ways you can leave a lasting impact. 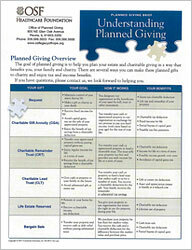 A bequest may be made in your will or trust directing a specific gift. Receive estate tax charitable deductions. *Please contact your CPA or Tax Advisor for individual guidance. Gift a percentage of your estate. Gift a specific dollar amount of assets. The online will planner is designed to help you gather the information your attorney will need to plan for your future. If you are like most individuals, the value of your stock and other investments has grown over the past years. Perhaps you are entering your retirement years and wondering how you can turn your highly appreciated assets into extra income.